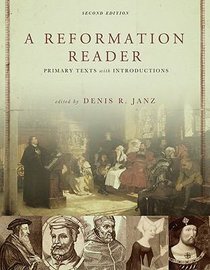 "Denis Janz's A Reformation Reader captures the energy and moment of that tumultuous time in a trove of over one hundred carefully edited primary documents. Along with plenty on the late-medieval background, the Lutheran, Calvinist, Radical, English, and Catholic Reformation are all well represented here. This new edition incorporates a dozen readings by and about women in the Reformation, adds a new chapter on Thomas Muntzer and the Peasants' War, and adds graphics, maps, and a companion Website with many student and teacher aids." --BOOK JACKET. - Publisher Provides additional readings that include women in the Reformation; searchable text; images and bibliographies; helps for writing papers; and various pedagogical tools. Provides additional readings that include women in the Reformation; searchable text; images and bibliographies; helps for writing papers; and various pedagogical tools. Denis Janz received the Ph.D. from the University of St.ý Denis Janz received the Ph.D. from the University of St. Michael's College, Toronto, in historical theology. He teac Michael's College, Toronto, in historical theology. He teaches in the religious studies department of Loyola Universityhes in the religious studies department of Loyola University, New Orleans and has published articles on late medieval an, New Orleans and has published articles on late medieval and Reformation topics in various scholarly journals. d Reformation topics in various scholarly journals.